Yesterday afternoon my friend Tsunimee aka Liloo from Le Petit Jardin de Liloo referred a few lovely twitteristas to me to help them install Google Analytics and while I wasn’t being the greatest help as I was out and about spending time with my parents and my brother and his wife, I thought it’d be useful for other bloggers to understand how to install Google Analytics. But not just that, I’ll also try and explain how it works, what it does, why it can be useful for bloggers, where its limitations are, etc. So let’s get started! What does Google Analytics tell us? GA can tell you multiple things. But basically for most things the one thing counts: The higher the better. Except for one exception, which I will explain in a minute. #1: GA can tell you how many people come and visit your blog – they are called “visits“. This includes visits by returning as well as new readers. This is – as far as I know – tracked by each person’s IP address (as soon as you dial into the internet, your internet service provide gives your computer a unique address which is called IP). So if someone were to access your website through their mobile (without using your Wifi) and through their computer, this would be counted as two visitors. If they were to use the same internet access (the mobile uses the home wifi) then it would be only counted as one (I hope this makes sense). Same if the same person returns to your website multiple times the same day – it’s only counted as one. So visitors is a really good stat to know. #2: Unique visitors basically counts every visitor only once per IP. Sometimes the difference between these numbers is minor, depending on your audience. But the key is that if someone returns twice to your blog on the same IP address, its counted twice into the visits but only once into the unique visitors. #7: Bounce Rate tells you basically how many of your visitors leave after seeing just one post. This one you want to be as low as possible because obviously you don’t want people to leave your website as quickly as they arrive. #8: New Visits is hopefully self explanatory. You can also display information for different time periods – you can look at just the past month, or the past 30 days, or the past 90 days, or whatever. Installing the GA code isn’t too difficult, but it does require a bit of attention to detail. I hope these simple steps will help you! You need to sign up to GA through this link. You need to create a new GA account in Account Admin, add your blog’s address, and accept the T&Cs. 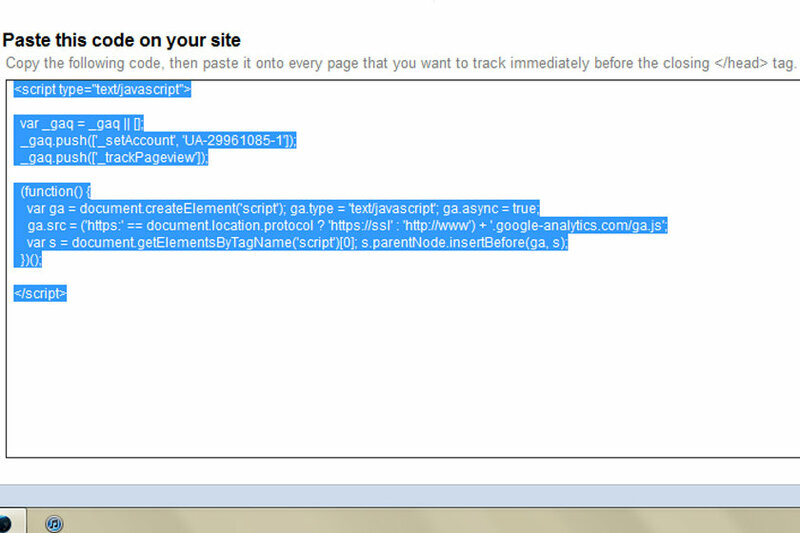 You will then get a code displayed by GA [similar to this one below], that you need to highlight and copy. This code is unique to you, no one else will have this code so it’s important you don’t modify this. do not copy this code – it is unique to my blog and will not work on yours!! You need to go to Blogger/Blogspot (or to your WordPress code – please note: I’m not very good with helping on WordPress matters so I’d like to refer to my geek twin Faye Marie who is a pro at all matters WordPress), then click on “Design” and then onto “Edit HTML”. Press the Ctrl and F keys on your keyboard together and type in “” (without the ” before the < and the " after the > !!! ), which will take you to the bottom of all the things that will always be displayed on whatever page you are on within your blog, which is a requirement for the code working correctly. Once you’ve located the line with ““, click right in front of it so that the cursor flashes there and hit your backspace key to create a new blank line and to move this “” one line down. Into this new line, that is right above the “” you will now paste the code you have just copied from Google Analytics (the one that was automatically displayed when you added your blog’s address and accepted the T&Cs). Once you’ve inserted that GA code, click on “Save Template” below the text field (do not be worried, if you follow the steps above, you will NOT break your blog) and your GA code is up and running (it will take a while for GA to recognise that it’s there and running, but it will start counting traffic as soon as it does). How long does it take to see stats? As soon as GA recognises your code as working (which shouldn’t take too long), you can see your data coming in via google.com/analytics. Obviously, to really see a trend, it might take about 30 days to really see a development. I always display the data for the past 30 days to see where my blog’s ups and downs were etc. What stats are relevant for PRs? Does Google have any shortcomings? Say you run your blog via Blogger/Blogspot – you automatically have a .blogspot.com (or .wordpress.com) address (like me, it’s msdriftedsw.blogspot.com). If you set up your GA code for this address, it will track the traffic that has that address in it some how. Fantastic. But say you also have a .com or a .co.uk domain for your blog, like me (missdriftedsnowwhite.com). My blog is accessible via both addresses. I for example have set up my GA code to track my .com traffic. If someone reaches my blog by typing in my .blogspot.com address and anything with it, GA doesn’t track the traffic properly. Unfortunately the only solution is setting up 2 GA codes and paste both into before “” – there’s no way of joining this traffic up. Some bloggers only decide to get a domain at a later time when their blog is already established under the old address, some people will continue to access the website typing in the old address (London Lipgloss for example got relatively recently a .com domain as far as I know, but I didnt know until recently and always accessed her blog via her .blogspot.com address because that’s what I knew it under). For those who monitize their blog, this can cause major issues when their ads payout are based on their traffic etc. It’s a right hassle. Here’s what I mean (I probably shouldn’t be sharing these stats, but what the heck). Seeeee the issue?! Heck knows how this difference can be so dramatic but God knows what else would vary between these two stat meters alone!! notice how the pageviews differs MASSIVELY?! Should I run multiple stats counters? It definitely can’t hurt. Most bloggers run multiple stats counters – Additionally to GA, I use the stats that Blogger itself provides under the Stats-tab (unfortunately it doesn’t display information like unique visitors, visits, etc – its only really good for pageviews, traffic sources and demographic information), and I also use SiteMeter. They all use slightly different technology to track traffic on your website, none of them are 100% accurate and each have their drawbacks, but together they can give you a more holistic overview of your actual traffic – you will most likely also see that GA isn’t 100% accurate (just look at the picture above!!). I hope you will find this post helpful. I know this can be really confusing and I sometimes forget how confusing it was for me when I started web developing. Always remember, you are not stupid or thick for not understanding this stuff! This is really complicated technical stuff that even I barely understand – I only understand enough to explain it to you because I have been living a geek life since I was 14 teaching myself web design and HTML and all that jazz! But I am glad that I might be able to save other people some of those extreme headaches and frustrations that I faced when I learnt all of this crap haha. Thanks for this post, was wanting to install this but had no clue where to start, will try it tonight. Helpful? Bookmarked for future reference ;) ! Thank you for this! I've been wanting to set this up for a while but never seen a proper 'tutorial' on it. I think I will have to sit down some time this week and sort it out. I just installed it, thanks for the help!I also thought I should mention that GA now offers 'One domain with multiple subdomains' so you can use it with your blogspot and .com address. What does that even mean? You have me completely lost. I’ve seen others say to put the code before /body and then others say before /head. What the heck is “”?? What’s up, I wish for to subscribe for this website to get newest updates, therefore where can i do it please help. You’ll be able to absolutely go to your capabilities within the works of art you write. The entire world desires of additional zealous writers such as you that usually are not scared to note the direction they imagine. Constantly follow the cardiovascular system. Nice post. I learn something totally nnew aand challenging on blogs I stumbleupon every day.